Almost three years ago I did these nails, which were inspired by The Polish Well. They were done during my first couple of months of playing around with nail art, and I remember being so proud! It's such a cute design; I love how it continues across all of the nails. Both times I've done this I've spent half of the painting-time brainstorming new ideas with the same basic theme; a bumblebee path, paper aeroplane, heart rate monitor... they encourage endless inspiration! I asked on Facebook and Instagram recently about which of my very first designs I should recreate, and this one won (by a very narrow margin). As you can see, they're quite different than my last ones, as I turned them into something of a kite and switched all the colours around. 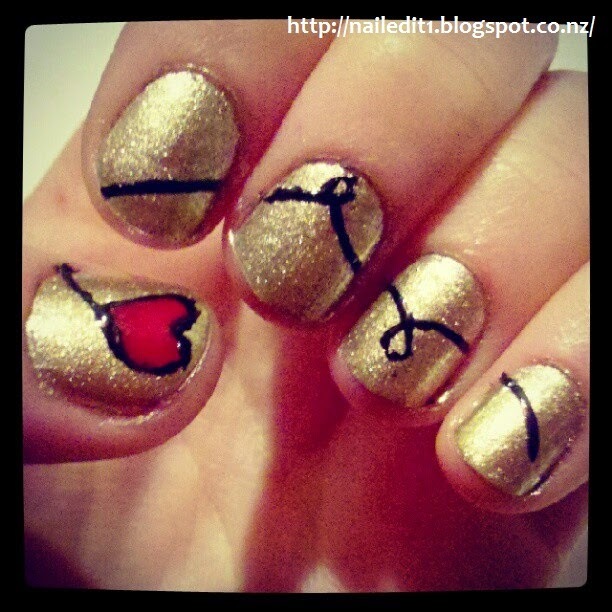 Initially I tried it with a red heart as well, but it just didn't look right, so I went over it with gold. Here's a shot of the last time I tried this design, back in May 2012. I chose a white with a beautiful shimmer in it for the background colour; White Wedding by Picture Polish. The rest of it was painted in acrylic paint - a choice I regretted half-way through. So many people say that using acrylic paint is easier than polish, but I am yet to see any real benefits. Occasionally I like it, but overall I prefer polish; I'm just more familiar with it, I guess. It's officially less than a month until Auckland now - so close! We're looking at wallpaper and furniture for our new place, it's all very exciting ☺. The beautiful weather here in Palmerston North has been continuing - today was pushing 30 degrees celcius. Can't complain! A new YouTube tutorial will be up on Friday, based on the music video for Meghan Trainor's "Lips Are Movin.'"